Alaska, the last frontier state with the capital being Juneau. The second to last territory to enter statehood in 1959, it is an area full of beautiful scenery and untouched nature. Many come here for the great outdoors, where the air is crisp and wildlife plentiful. The economy is driven by its abundance of natural resources, primarily oil and natural gas. A large portion of the fish we eat is brought in from Alaska as well. There are only 738,000 people in the vast expanse of Alaska, making some of its cities the safest in all of the nation. The second to last territory to enter statehood in 1959, it is an area full of beautiful scenery and untouched nature. Many come here for the great outdoors, where the air is crisp and wildlife plentiful. The economy is driven by its abundance of natural resources, primarily oil and natural gas. A large portion of the fish we eat is brought in from Alaska as well. 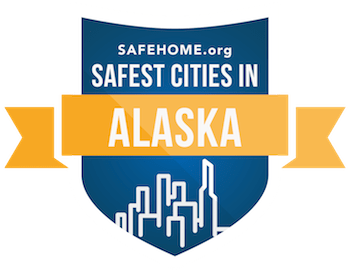 There are only 738,000 people in the vast expanse of Alaska, making some of its cities the safest in all of the nation. Of the 25 safest cities in Alaska, the highest rated cities have a rating above 90. Most states have cities with a safety rating in the 80s, but not many can say they have any in the 90s. The bottom few cities in Alaska though have a safety rating in the low 60s. And on the national level, only Anchorage shows up with a rating of 64.03. Bristol Bay Borough ranks as our safest city in Alaska. It is located on Bristol Bay, which is the southwest part of the state. The population is shrinking in this part of Alaska though, with a peak of 1410 residents in 1990 down to 892 in 2015, so its high safety rating of 96.53 is mostly due to such a small population and therefore a much lower chance of any crime. The next safest city is Cordova with a safety rating of 93.99 and a population of 2,196. This town is also shrinking in size since 2000, and can only be reached by plane or ferry. Anchorage is where half the population of Alaska resides. There are 279,243 residents here. As stated above, the safety rating is 64.14, while not as high as the tiny towns elsewhere in Alaska, is still a decent rating given the size of the population compared to other equivalent cities in the United States.